Westmere-Angela G. Padula, 85, passed away on Thursday, November 29, 2018. 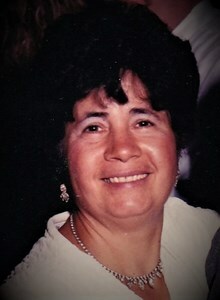 Born on July 3rd, 1933, she was the daughter of the late Joseph and Rose Galea. Angela loved to cook and garden. She was an active member of Christ the King Church and a lifelong member of the Ladies Auxiliary of Westmere Fire Department. She loved spending her winters in Florida. She was predeceased by her daughter, Linda Papale, and her brother, Carlo Galea. Angela is survived by her loving husband of 61 years, Rocco M. Padula, her daughters, MaryAnn (Robert) Ferraro, Susan (Thomas) Brown, her son-in-law, Andrew Papale, her grandchildren, Michael Ferraro, Christina (Frank) Cimmino, Jennifer Brown, her sisters, Mary (Rocco) DePremis, Ellen (Dante) DiPrimo, her brothers, Dominick Galea, Joseph (Sylvia) Galea and many nieces and nephews. Calling hours will be held on Wednesday, December 5, 2018, from 4:00pm-7:00pm at New Comer Cremations & Funerals, 343 New Karner Road, Colonie. A prayer service by Christ the King’s Bereavement Committee will be held at 4:30pm. A Mass of Christian Burial will be celebrated on Thursday, December 6, 2018 at 10:00am at Christ the King Church, 20 Sumter Ave, Albany, NY 12203. Burial at St. Agnes will follow the Mass. Add your memories to the guest book of Angela Padula. Dear Rocco and Family- Angela always shared a beautiful smile with us all at Christ The King. She was one of those people we could count on seeing at Church and she will be missed by many. Always very kind and warm to everybody we can only imagine what a great loss her passing is to your family. You will be in our prayers. My heart is with all of you. I sit here and I think of all the memories of us growing up and how we would spend Christmas Eve at your home. I think about how proud she was of all her plants and her garden. She was a beautiful person and I am proud to call her my Aunt. Take care of one another and especially your dad. She and Linda are smiling down on you all right now. All my love to you all. Aunt Angie was one of the sweetest women I have ever known and we were so blessed to have her in our lives. We are heartbroken by her passing, and for her daughters and husband. Please know that we are hear for all of you for anything you need.